A petition calling for the families of the Shoreham airshow tragedy victims to be given legal aid has been signed more than four thousand times. Claire Miles, whose nephew Daniele Polito was the youngest of the 11 men who died, said she was surprised by the ‘great response’ it had received. She said she was spurred on to start the petition after watching Tim Loughton MP tell the House of Commons that the decision by the Legal Aid Agency not to extend funding to the families was ‘inequitable’. The 61-year-old, of Highclere Way, Durrington, said: “Having to watch my sister struggle without any answers and no finality to it...it’s awful for the whole family. “You’re living with it every day. She said it was ‘ridiculous’ that the family had been refused funding for a representative at the inquest from the exceptional cases fund. “This is exactly why it was started up in the first place,” she said. “Everybody else when they go to the courts will have a representative. 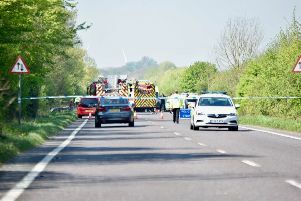 Claire’s nephew Daniele was just 23 when he was killed while travelling in a car after a Hawker Hunter jet crashed into the A27 during an airshow display in 2015. His death left his two boys fatherless and Claire said his eldest son Georgio ‘misses him dreadfully’. She said his mother, her sister Leslye Polito who lives in Goring, was trying her best to cope with the tragedy. As a mother of two herself, Claire said: “It’s absolutely dreadful. I can’t imagine how she feels. Claire’s sons, aged 27 and 31, were ‘always very close’ with Daniele and were ‘devastated’ by his death. Claire said of the petition: “It’s not been going that long and it’s done amazingly well in a short time. Tim Loughton MP said: “It is clear there is very widespread support for the Legal Aid Agency to change its view. “I applaud the initiative of one of the relatives setting up a petition which has now attracted over 4000 signatures in very short order.